Seasonal dark streaks on Mars that have become one of the hottest topics in interplanetary research don't hold much water, according to the latest findings from a NASA spacecraft orbiting Mars. The new results from NASA's Mars Odyssey mission rely on ground temperature, measured by infrared imaging using the spacecraft's Thermal Emission Imaging System (THEMIS). They do not contradict last year's identification of hydrated salt at these flows, which since their 2011 discovery have been regarded as possible markers for the presence of liquid water on modern Mars. However, the temperature measurements now identify an upper limit on how much water is present at these darkened streaks: about as much as in the driest desert sands on Earth. When water is present in the spaces between particles of soil or grains of sand, it affects how quickly a patch of ground heats up during the day and cools off at night. "We used a very sensitive technique to quantify the amount of water associated with these features," said Christopher Edwards of Northern Arizona University, Flagstaff. "The results are consistent with no moisture at all and set an upper limit at three percent water." 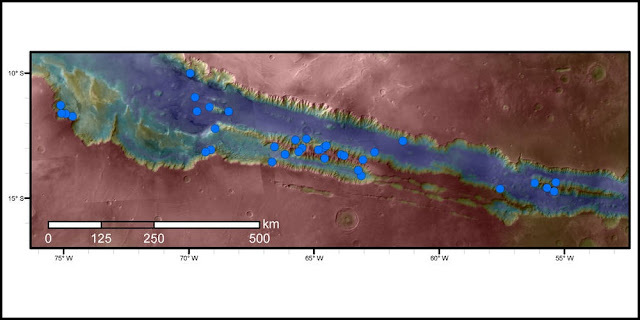 The features, called recurring slope lineae or RSL, have been identified at dozens of sites on Mars. A darkening of the ground extends downhill in fingerlike flows during spring or summer, fades away in fall and winter, then repeats the pattern in another year at the same location. The process that causes the streaks to appear is still a puzzle. "Some type of water-related activity at the uphill end still might be a factor in triggering RSL, but the darkness of the ground is not associated with large amounts of water, either liquid or frozen," Edwards said. "Totally dry mechanisms for explaining RSL should not be ruled out." He and Sylvain Piqueux of NASA's Jet Propulsion Laboratory, Pasadena, California, analyzed several years of THEMIS infrared observations of a crater-wall region within the large Valles Marineris canyon system on Mars. Numerous RSL features sit close together in some parts of the study region. Edwards and Piqueux compared nighttime temperatures of patches of ground averaging about 44 percent RSL features, in the area, to temperatures of nearby slopes with no RSL. They found no detectable difference, even during seasons when RSL were actively growing. The report of these findings by Edwards and Piqueux has been accepted by the peer-reviewed Geophysical Research Letters and is available online. There is some margin of error in assessing ground temperatures with the multiple THEMIS observations used in this study, enough to leave the possibility that the RSL sites differed undetectably from non-RSL sites by as much as 1.8 degrees Fahrenheit (1 Celsius degree). The researchers used that largest possible difference to calculate the maximum possible amount of water -- either liquid or frozen -- in the surface material. How deeply moisture reaches beneath the surface, as well as the amount of water present right at the surface, affects how quickly the surface loses heat. The new study calculates that if RSL have only a wafer-thin layer of water-containing soil, that layer contains no more than about an ounce of water per two pounds of soil (3 grams water per kilogram of soil). That is about the same concentration of water as in the surface material of the Atacama Desert and Antarctic Dry Valleys, the driest places on Earth. If the water-containing layer at RSL is thicker, the amount of water per pound or kilogram of soil would need to be even less, to stay consistent with the temperature measurements. Research published last year identified hydrated salts in the surface composition of RSL sites, with an increase during the season when streaks are active. Hydrated salts hold water molecules affecting the crystalline structure of the salt. "Our findings are consistent with the presence of hydrated salts, because you can have hydrated salt without having enough for the water to start filling pore spaces between particles," Edwards said. "Salts can become hydrated by pulling water vapor from the atmosphere, with no need for an underground source of the water." "Through additional data and studies, we are learning more about these puzzling seasonal features -- narrowing the range of possible explanations," said Michael Meyer. “It just shows us that we still have much to learn about Mars and its potential as a habitat for life." The new study touches on additional factors that add to understanding of RSL. -- If RSL were seasonal flows of briny water followed by evaporation, annual buildup of crust-forming salt should affect temperature properties. So the lack of a temperature difference between RSL and non-RSL sites is evidence against evaporating brines. -- Lack of a temperature difference is also evidence against RSL being cascades of dry material with different thermal properties than the pre-existing slope material, such as would be the case with annual avalanching of powdery dust that accumulates from dusty air. Arizona State University, Tempe, provided and operates the THEMIS camera, which records observations in both infrared and visible-light wavelengths. JPL, a division of Caltech, manages the Mars Odyssey project for NASA. Lockheed Martin Space Systems, Denver, built the orbiter and collaborates with JPL to operate it.